GARLAND, Augustus Hill, a Senator from Arkansas; born in Tipton County, Tenn., June 11, 1832; moved with his parents to Hempstead County, Ark., in 1833; attended St. Marys College and graduated from St. Josephs College in Kentucky in 1849; studied law; admitted to the bar in 1853 and commenced practice in Washington, Ark. 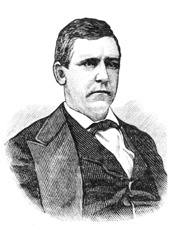 ; moved to Little Rock in 1856; Union delegate to the State convention that passed the ordinance of secession in 1861; member of the provisional congress that met in Montgomery, Ala., in May 1861 and subsequently of the Confederate Congress and served in both houses; elected to the United States Senate for the term beginning March 4, 1867, but was not permitted to take his seat, as Arkansas had not been readmitted to representation; Governor of Arkansas 1874-1876; elected as a Democrat to the United States Senate in 1876; reelected in 1883, and served from March 4, 1877, to March 6, 1885, when he resigned to accept a Cabinet post; chairman, Committee on Territories (Forty-sixth Congress); appointed Attorney General by President Grover Cleveland, and served 1885-1889; resumed the practice of law in Little Rock; died in Washington, D.C., January 26, 1899; interment in Mount Holly Cemetery, Little Rock, Ark. American National Biography; Dictionary of American Biography; Garland, A.H. Experience in the Supreme Court of the United States, with Some Reflections and Suggestions as to that Tribunal. Littleton, CO: Fred B. Rothman, 1983; Schlup, Leonard. Augustus Hill Garland: Gilded Age Democrat. Arkansas Historical Quarterly 40 (Winter 1981): 338-46.